Seven in Bed, self portrait video projection, 15:17, single channel HD video, curtain, projector, Micca media player. 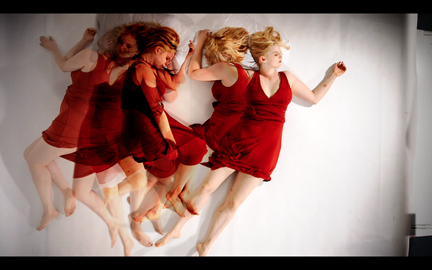 Seven In Bed is a video installation that explores the transitory nature of the human presence and the ability of the human image to leave a mark. The video is projected onto a sculptural structure made of fabric, evoking bed linens or burial shrouds.